Looking to buy a small size, designer casual backpack for your school, college in low price. Here is a good deal for you. 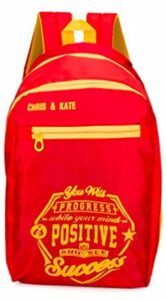 Amazon is offering Chris & Kate Polyester 27 Ltr Red School Backpack at Rs 199 only. Hurry!!! Order now before the price goes up. Chris & Kate has not authorized any other seller to sell their products. Buy genuine products by ensuring that the seller name is Chris & Kate only; Warranty type: Manufacture, Warranty is applicable if seller name is Chris & Kate; Accessories: High Quality Zippers & accessories, Well stitched, finished seams for added durability and extend its life. Accessories shown in the picture are not part of the bag.